Although we just saw the 2018 Lamborghini Huracan Performante at Geneva earlier this month and learned about its insane new Nurburgring record, we’re still partial to rear-wheel-drive Lamborghinis. Thing is, the Italian supercar company builds only one RWD model, and that’s the Huracan LP580-2. Not only is it the cheapest Lamborghini in the lineup, but it may also be the best modern interpretation of that old school Lamborghini awesomeness. Oh, and you can drift it. We recently spent time with the 2017 Huracan LP80-2 and fell in love all over again. Powered by that ever wonderful naturally aspirated 5.2-liter V10 with 572 hp and 398 lb-ft of torque, total output is only slightly down compared to the all-wheel drive 602-hp Huracan LP610-4. Unlike the gone but not forgotten Gallardo Valentino Balboni Edition, also RWD, a six-speed manual is no longer available. It’s a shame, but a sacrifice we can live with because the Huracan’s seven-speed dual-clutch is also quite something. Our sampler came with the optional $4,500 Verde Mantis (fancy way of saying ‘Green’) exterior paint and a Nero (uh, black?) interior with contrasting stitching. There’s something about a green Lamborghini that no Ferrari or McLaren can quite match. 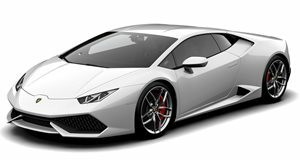 With its 0 to 60 mph time of 2.9 seconds and top speed of 199 mph, the 2017 Huracan LP580-2 is the preferred choice for supercar shoppers looking for old school bonkers that only Lamborghini can pull off. Special thanks to Los Gatos Luxury Cars for letting us film the car.